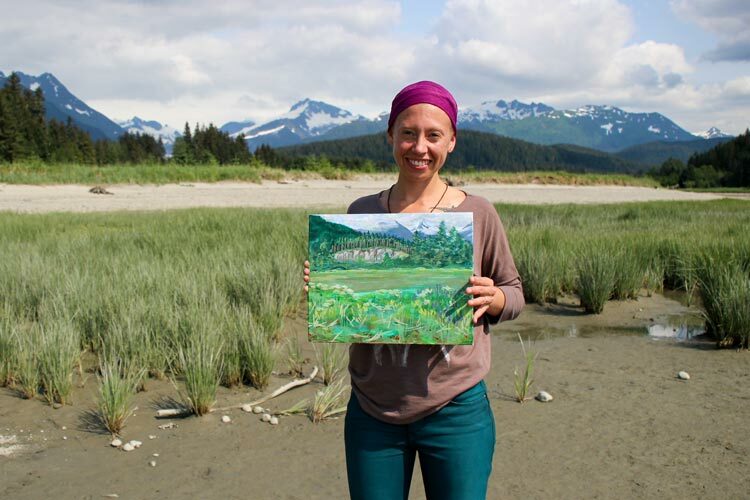 The Juneau Afternoon show, produced by Juneau’s KTOO, invited Lindsay to chat about art and the painting tour. Here’s their discussion! Our next guest this afternoon, this Monday 27th of July, is Lindsay Carron. She is here to talk about a very fun subject I have no doubt: Painting Eagle Beach. Good afternoon Lindsay. Thanks for joining us. I hope you don’t plan on painting Eagle Beach this afternoon because your canvas is going to get a little bit wet, but once the weather improves, when are you are going to be painting Eagle Beach? We are actually taking a tour tomorrow. If it isn’t weather conducive, we have big tents we setup and make it very comfortable regardless of the rain. What’s involved in the whole Eagle Beach program? It sounds like a turn-key opportunity for someone who is interested in getting out there and painting something like that for the first time. Sure! I work for Adventure Flow, a start-up company here in Juneau. They brought me on as an art guide. They thought it would be something very unique to offer visitors and residents alike. I take them out to Eagle Beach and it’s a whole new way of exploring the land and what it offer people through a creative lens. Absolutely! And so what’s you history? Are you from around here? Were you really familiar with Eagle Beach before you became an instructor out there? I grew up in Wisconsin and I currently live in Los Angeles, California. I came out here for the very first time this summer. I’ve been really indulging in the hiking, learning all about Juneau, and all of the land and spending a lot of time at Eagle Beach – getting very familiar with it. That was the first time at Eagle Beach when you came out here this summer. It’s a pretty special place isn’t it? Yes! Magical and it changes every day. And of course some listeners may know it’s our only state park recreation area in Juneau. So if you buy one of those state park daily passes, you can use it there, and not have to pay for parking. But use it anywhere else, you need to take the ferry. When in the summer did you start doing this? How many groups have you taken out there? What balance of locals to visitors has it been? I came up here in May, and we started right away in June. And we’ve taken out, I feel we’ve taken out about 5 trips so far. From two people to ten people. I really enjoy the small groups. They are intimate and I get a lot of hands on with the people. That sounds great. What have some of the visitors been like. Are they independent travelers? Are they from the cruise ships? Or a combination of both? Definitely a combination of both. I think that what we offer as Adventure Flow is good for the independent travelers, those who are a little bit more adventurous, and want off the beaten path adventure. We’ve had cruise ship people come on our tours, and I also love offering it to locals. Absolutely! Well this experiential art is kind of an up and coming thing. Lots of artists are trying to find way to share their work with untapped audiences and not just make a performer and audience thing. Or a painter and viewer sort of a thing. But to blur that line between the creation and the appreciation. Let me ask you some logistical questions. You have some tents setup in case it’s not bright, and you’ve had some nice bright sunny days, I trust? Actually, every tour we’ve lead so far out at Eagle Beach has been sunny, but tomorrow I think we are going to have to test something else out. Well I’ll have to say Lindsay, you wouldn’t get the full Juneau experience if you didn’t have a day like today, or tomorrow, and I don’t know if tomorrow is going to be like today, but hypothetically if it is, that’s part of the full Juneau experience. It will be good for you. If it’s not raining, you don’t have to be under the tent. But what is the media you are using. Is it more than one type of surface and paint? Is it more standard? Tell us a little more about that. Sure. We give everyone sketch books, we start out with sketching exercises, getting people warmed up, and a little bit more flexible. I actually do some meditation with everyone as well to get people to drop into a space and let go of their inhibitions. Than we use acrylics on the canvas. We provide everything including the canvas, the paint, the brushes, all the supplies needed. Acrylic is water based paint so it is very easy cleanup. Excellent. When they are done, are they able to take the sketches home with them, or do you hang on to them, or do you ship them if they have transportation challenges? We will ship if necessary, but we like everyone walking on home with their canvases in hand. And they aren’t ginormous canvases I take it. No they are very easy to pack in a suitcase and travel with. When you are back in L.A., are you a full time artist there? I am. I do it full time and I travel with my art and do murals different places. A lot of social activism as well with my artwork. That’s another thing a lot of artists are finding a way – of course that’s been going on for millennia – I see a lot of artists are trying to find a ways to put a specific social activist, or world changing element into the art they create. Do you think you will be coming back Alaska in future art … first of all I should ask if you plan on doing this in the winter, Eagle Beach is very different in the winter. Have you thought about that at all well? I’ll be here through October. I actually have a solo exhibition at the Juneau Arts and Humanities Council. I’m very excited about that. It will be through the month of October. I will probably depart in the beginning of November in Los Angeles. That’s not a bad time to go. Some people are cynical about the rain and the wind when we get to fall here. We need to rain we need the moisture. If people are interested in learning more about Adventure Flow generally, and I should ask you what other programs, you said this is one thing this startup is doing, are there other Adventure Flow activities you’d like to have listeners learn a little bit more about. Yeah. We offer hiking tours on West Glacier Trail. It’s a great opportunity to get really intimate with Mendenhall Glacier, super spectacular views. It’s a little more of a challenging trail, so it also gets people a little out their comfort zones which is really excellent. We also offer walking tours of downtown Juneau. Excellent. West Glacier Trail, downtown Juneau, or painting at Eagle Beach. Three of the offerings from Adventure Flow. 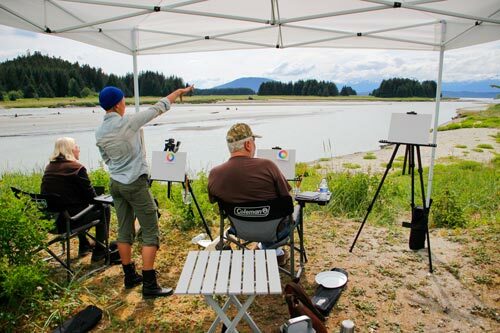 As you said it’s a new company here in Juneau and if people are interested, locals, or if they have people visiting, they may want to sign up for one of these activities, how would the go about doing that. And they can actually register there on the website? Excellent! Lindsay Carron, anything else you would like to share with listeners on a Juneau Afternoon? Well I appreciate you having me and I’m very excited to be here in Juneau. It’s been so full of inspiration! Excellent! Well we love welcoming to Juneau generally, artists specifically, because we are such an arts rich town, and congratulations on having a solo show at the JAHC. That’ll be opening first Friday in October if you are going to be here the whole month. Who knows, we may have Lindsay back on to talk about that show because we don’t have time to talk about that right now. Thanks again Lindsay Carron for joining us on a Juneau Afternoon.